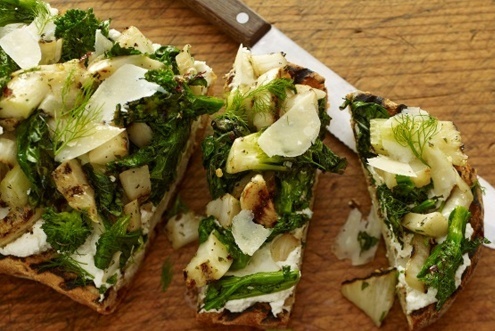 Pair broccoli rabe with fresh fennel, creamy ricotta and shaved Parmesan to make this attractive starter. The vegetables are grilled to increase their umami notes and intensify the savory flavor. Mix oil, Italian seasoning, garlic powder, red pepper and sea salt in large bowl. Reserve 1 tablespoon for drizzling. Add broccoli rabe and fennel to bowl; toss to coat well. Let stand at least 10 minutes. Grill broccoli rabe and fennel on one side of grill over medium-high heat 4 minutes per side or until charred and tender-crisp. Grill bread halves on other side of grill 2 minutes per side or until grill marks appear. Cool broccoli rabe and fennel slightly then coarsely chop. Spread ricotta evenly on cut sides of grilled bread. Top with broccoli rabe and fennel. Drizzle with the reserved oil mixture. Top with shaved Parmesan cheese. Sprinkle with additional sea salt and garnish with fennel fronds, if desired. Cut each bread half into 12 slices. Serve immediately. Drizzle toasts with balsamic glaze. It’s a reduction of balsamic syrup that is used to drizzle over grilled meats, salads or even desserts. Top toasts with 3 slices prosciutto, grilled and coarsely crumbled. To grill prosciutto, grill over medium-high heat 1 to 2 minutes per side or until crisp.